Get The Flu Vaccine Or Not? A doctor of chiropractic looks at your overall health – focusing not only on your spine, and extremities but also on your lifestyle. After an initial history, an examination is performed and x-rays are often taken. Based on the findings, the chiropractor will recommend an individualized treatment program to correct the subluxations. She may also suggest diet, exercise and lifestyle changes, and help implement them. If it is determined that your condition cannot be helped with chiropractic care, you will be referred to the appropriate healthcare provider. There are no age limits to seeing a chiropractor. Adjusting methods are always adapted to a patient’s height, weight, age, and specific complaint. Subluxations can occur at any age and eliminating them causes substantial improvement in quality of life for all. For children and teens, chiropractic care can help prevent any postural distortions that may lead to complications later in life. For the older population, adjustments improve range of motion, allowing for a fuller, more active lifestyle. Yes! As stated above, adjusting methods are always adapted to a patient’s size, weight, age, and specific complaint. In addition, most pregnant women find they have easier pregnancies and deliveries when they receive regular chiropractic care. In addiiton, there are gentle adjusting methods that are often used on pregnent women and children. This is a common misconception. While most people feel so good with regular chiropractic care that they choose to come on a regular basis to prevent any further subluxations from arising, it certainly isn’t required. 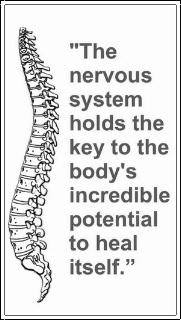 Chiropractic delivers care on three levels: pain relief, corrective care, and maintenance care. The goal of pain relief is to eliminate immediate symptoms and requires more, frequent visits. Corrective care focuses on treating the underlying cause of your problem. Maintenance care focuses on maintaining the progress of the corrective phase and preventing further subluxations. This requires less frequent visits and usually corresponds with a brief check-up. For optimum health, it is recommended that you go through all three stages, though the ultimate decision is always up to you. 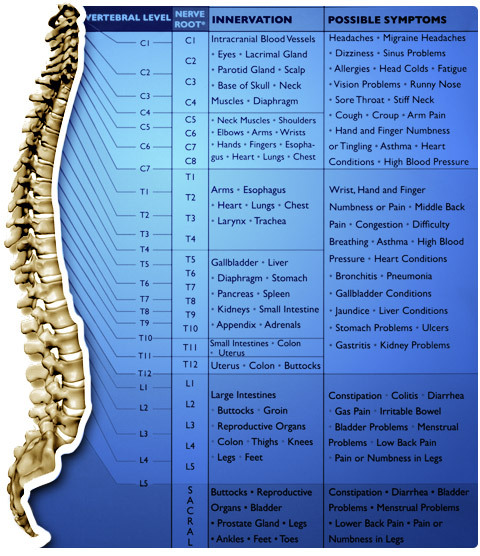 To see the Spinal Nerve Chart showing the nerves of the body and what they influence click here.